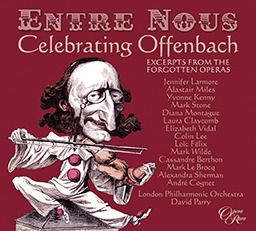 Entre Nous: Celebrating Offenbach traces the extraordinary career of one of the great personalities of the 19th century, the composer, entrepreneur and satirist Jacques Offenbach. 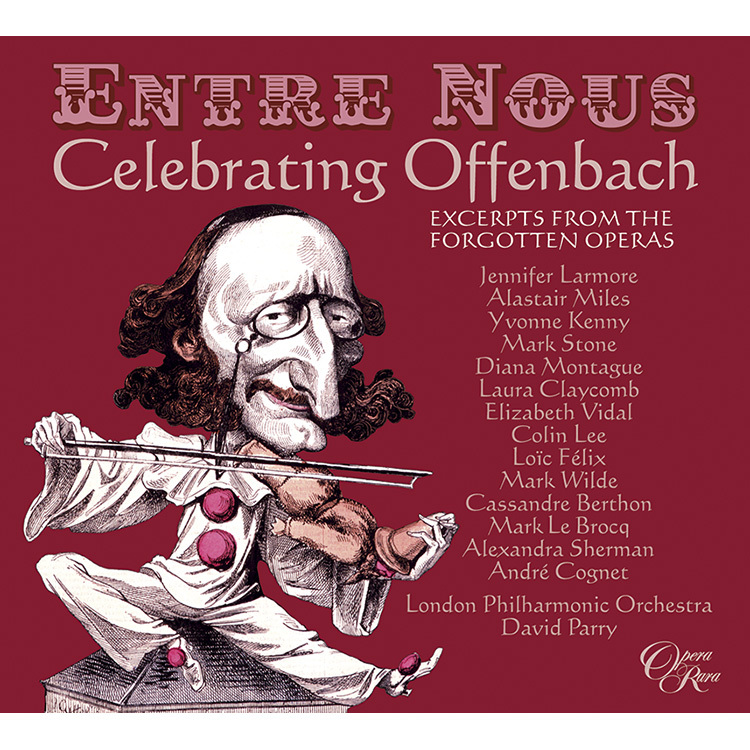 Entre Nous: Celebrating Offenbach traces the extraordinary career of one of the great personalities of the 19th century, the composer, entrepreneur and satirist Jacques Offenbach. He composed over 100 stage works, yet only a fraction of Offenbach’s output is regularly performed today. 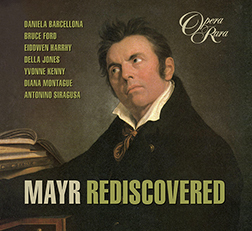 This brand new recording of rare arias, duets and ensembles, selected by the late Patric Schmid, assembles some of the finest moments from Offenbach’s forgotten works, performed by an impressive group of international stars.Offenbach’s composing life was driven in part by a desire for commercial success and he opened his first theatre, the Bouffes-Parisiens, in 1855 with a mission to revive the art of high-quality comic opera. However, the notorious jester who spent so much time poking fun at the leading figures of his day longed to be taken seriously by the musical establishment.Offenbach pinned great hopes on his works for the Opéra-Comique, including the delightful Vert-Vert, which brought him closer to his ‘serious’ style. Along the way there is much Offenbachian charm and wit. Listeners will discover the once wildly popular Geneviève de Brabant, the risqué La Jolie Parfumeuse, and Le Roi Carotte (where Prince Fridolin’s kingdom is taken over by vegetables!) and see the personalities of Offenbach’s world coming alive (including Hortense Schneider, whose life-story is dramatised in the preposterous La Diva! 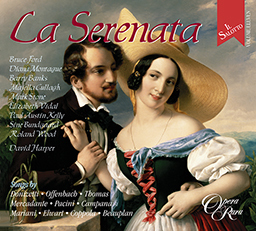 ).The recording comprises brand new editions created by Jean-Christoph Keck and the 2 CD set is accompanied by a 240 page booklet containing notes and texts for each excerpt by Offenbach devotee, Nicholas Jenkins. Jennifer Larmore, Alastair Miles, Yvonne Kenny, Mark Stone, Diana Montague, Laura Claycomb, Elizabeth Vidal, Colin Lee, Loic Felix, Mark Wilde, Cassandre Berthon, Mark le Brocq, Alexandra Sherman, Andre Cognet. London Philharmonic Orchestra, Geoffrey Mitchell Choir, David Parry - conductor. 07 Les braconniers: Oh! Ma chere femme! 24 Le voyage dans la lune: Ohe! Ohe! Les badauds! 26 Boule de neige: Mais ne parlons pas si haut! 28 La boulangere a des ecus: Ce qu’ j’ai? tu le demandes? 29 La boulangere a des ecus: Ah! Qu’il est beau ce gaillard-la! 30 Une nuit blanche: Allons, Fanchette, allons! Versez, ma menagere! 40 Boule de neige: L’Hospodar nous invite a luncher avec lui, lunchons!